Proper appreciation and understanding of the work of French film critic Serge Daney is increasingly admitted to be a grave absence in Anglophone film criticism. 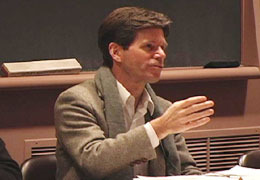 The past few years have seen a number of attempts to generate enthusiasm for Daney in the English-speaking world: the now-famous impassioned plea by Jonathan Rosenbaum, Chris Darke’s essay in Film Comment, Steve Erickson’s website and Block Cinema’s “Serge Daney: 10 Years After” screening and lecture series. 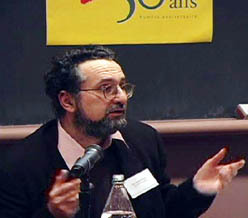 Most recently, Harvard University hosted a one-day conference entitled “Beyond Film Criticism: A Symposium in Homage to Serge Daney”. The conference took place at the Minda de Gunzburg Center for European Studies at Harvard University, and was preceded by a series of films reputed to be some of Daney’s favourites. On the eve of the conference the three-hour filmed interview with Serge Daney Itineraire d’un cinefils (Pierre-André Boutang & Dominique Rabourdin, 1992) was screened. There is no doubt that it is an exceptional document, and while it has been presented in the past at other Daney conferences, Harvard’s copy of the film was subtitled, giving the non-French speaking public a rare chance to acquaint themselves with Daney. Unfortunately only around 10 people attended the screening and at least half of them left before the end of the film. The following morning, the symposium opened with a brief introduction by the Harvard Film Archive’s curator Bruce Jenkins; then without delay the luminaries of the conference took the floor. The director of Cahiers du cinéma, Jean-Michel Frodon, launched proceedings with his talk “Serge Daney, Film Criticism as Self-Portrait and as a Global Theory”. It came as no surprise that this was among the strongest talks of the conference. Frodon, obviously unsure how to approach speaking about Daney in a country that repeatedly insists it knows nothing of his work, spoke of the influence Daney had on his own criticism. He spoke about the importance of the “I” in Daney’s work – that is, the importance of autobiography in Daney’s writing, a theme that was to be taken up by other speakers. Frodon went on to make connections between autobiography, Daney’s relation to cinema and Daney’s relation to the world. The talk began to wind down with a methodological comparison between Daney and Jean-Luc Godard, and closed with a plea to make Daney available in English. M. Frodon was followed by Dudley Andrew and his presentation “Serge Daney and the Legacy of Andre Bazin”, which asserted that Daney took Bazin seriously at a time when the Cahiers was breaking with its humanist past (and thus ultimately with Bazin), and working and reworking theories of ideology (ideology doesn’t look out onto the world but back onto the eye). Andrew identified shared concerns of the two thinkers: film as the world thinking itself; humans coming into contact with the world through cinema; and animals and their bringing human semiosis into contact with natural semiosis. One of the few speakers who actually brought up some of the theoretical terminology of Daney, Andrew finished his talk with a brief description of Daney’s ideas about the visual and the image. The third speaker of the morning panel was Bill Krohn, Hollywood correspondent for the Cahiers. Krohn began his talk on “The Vampires of the Caribbean” (an exceedingly intriguing title that, by the end of the talk, did not fail to deliver) by speaking about cinema and its two others: the world and the media. He identified a point of convergence here between Bazin and Daney, recalling the Bazinian issue of filmed theatre and Daney’s practice of examining televised films: what occurs in the translation from the big to small screen (see Ginger and Fred [Federico Fellini, 1986]). Krohn then made a calculated transition via a history of the Cahiers from the “yellow” period to the Maoist period and then into the period in which, by means of an interdiction, it found itself to be a film magazine with no images. Realising that this imageless film journal was a strange place for a figure like Daney to be tarrying, Krohn posed the question of what Daney was doing during this period. And then he gave us an answer. Krohn recounted Daney’s voyages to India and Africa in 1969. In India Daney interviewed James Ivory, and then began to walk into the heart of the country, walking in fact until he collapsed; it is possible that Daney had his first brush with TB during this trip. A jump forward to 1973: Daney, still travelling, ended up in Haiti. 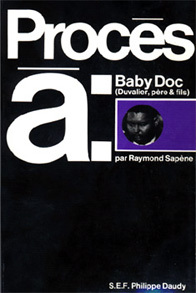 A further jump forward: in 2003 Krohn discovered that a series of books were published in the early ’70s that a number of Cahiers writers had contributed to, and one of the books, Procès à: Baby Doc (Duvalier, père & fils) (which Krohn dutifully entered into evidence) by one Raymond Sapène, on the subject of the Haitian blood trade via Hemocaribbean, was nothing less than the only complete book written by Serge Daney. Krohn insisted that the book contained indications of a Daneyan work to come, a work in the literary polemical tradition of Voltaire. Throughout the presentation, flanked by his Cahiers cohorts Frodon and Emmanuel Burdeau, Krohn assured us of the validity of this claim. Neither of the Cahiers indigenes flinched – no gasp, no raised eyebrows – and one therefore wonders: is it common knowledge that Raymond Sapène is Serge Daney and consequently the book will be compiled in the two upcoming volumes set to complete the four volume complete works of Serge Daney at P.O.L.? Or is it a hoax? The answer is uninteresting: what Bill Krohn presented was at the very least a wonderfully simulated coup. Straight-faced and seemingly unimpressed by this discovery (in fact he had spent most of Krohn’s talk flipping through the pages of the back issues of Cahiers Krohn had splayed out on the table), Cahiers editor-in-chief Emmanuel Burdeau delivered a talk that precisely took on the issue of the title of the conference. Burdeau took the time to address the issue of “Beyond”. He identified four ways of being “beyond” in film criticism: Politics, Journalism, Autobiography, and Literature. Politics, he suggested, was abandoned in the mid-’70s, whereas the other three still maintain a strong influence on film criticism today. The descriptions he offered of these remaining three categories were Journalism as a humanistic approach to criticism; Autobiography gives birth to new forms of criticism that suggest the individual experience of a film is as important as the film itself; and finally Literature is addressed to the issue of style, critics positing themselves as writers. He concluded that we do not need to worry about the “beyond” if we avoid rigid definitions of film criticism to begin with. That is, in a sense the beyond is already inextricably bound into the subject itself. Burdeau concluded that a fidelity to Daney would require a kind of avoidance of his ethical statements, and that instead we should look at the films which Daney identified as being haunted by writing, a writing which leads us from the screen to the world. French filmmaker Arnaud Desplechin, who was to play the role of moderator for this panel, ended up delivering a somewhat extemporaneous and contemplative talk on Daney. He began with a disclaimer, saying he didn’t feel he belonged at the conference, he didn’t know how he could contribute, that as a filmmaker surrounded by critics he was somehow unqualified to speak about a critic (interesting since none of the critics would hesitate to talk about a filmmaker). But as this dishevelled figure flipped through what appeared to be hastily prepared notes, it became apparent that he had much to say of interest. He began by describing the influence Daney had on him as a young cinephile. He described the classes Daney was teaching at Censier in the mid ’70s, overflowing into the hallways. He described Daney’s method of lecturing by first asking if there were any questions; in answering the questions he was able to move directly into his lecture, taking a clue from whatever question was asked. The description Desplechin offered was that of a jazz musician, in particular a free form jazz musician – not just the improvisational methods, but Daney’s voice, his manner of speaking, the movement of his hands. That is, it was performance. Desplechin then made some sweeping claims. He insisted that for him Daney was the only hope that films could be made again, that Daney somehow gave permission to make fiction films again, and here he moved into another sphere. Growing up under the tide of structuralism, a paralysis was felt by Desplechin and his contemporaries: how could fiction still exist? How could it be created? And after structuralism/post-structuralism broke everything, how could anything be shattered more completely than it had been already? Desplechin suggested that during this period there were no great French novels, except for two disguised as essays, both of which were written by a writer who had certainly thrown in his two cents concerning the disappearance of the author: Roland Barthes, and the great novels La chambre claire and Fragments d’un discours amoureux. And in another leap he concluded that Daney with La Rampe followed in this tradition of autobiographical novels. Desplechin concluded the first half of the day’s proceedings, and it has to be said that when the conference re-commenced in the afternoon a new tone was in place, marking the transition from the “Daney” of the conference title to the “beyond”. Yet this was not the “beyond” that Emannuel Burdeau spoke of, it was “beyond” in its most workaday sense: farther, yonder, without. The subject of Daney received its final sustained treatment by Tom Conley who pointed to the culinary references in Daney’s article “Le cru et le cuit (État du cinéma francais, 1980)” and championed a number of quotes from the essay, insisting on their excellence as writing. But from there the subject of Daney became a more and more distant reference. Apart from Klaus Eder who did give a nice paper on the history of criticism and the German New Wave the panelists became more and more concerned with the role of the film critic, and unfortunately the various formulations were far from productive. Particularly disappointing was Chris Fujiwara’s attractively and ultimately poignantly titled talk “The Exercise was Not Beneficial”– a great negative doubled citation, springing from John Mohune’s recurring line in Fritz Lang’s Moonfleet (1955) “The exercise was beneficial, sir”, which then became the title of a collection of Daney’s writing (L’exercice a été profitable, monsieur). But the Daney reference was minimal, and a profound inner struggle that Fujiwara seemed to be waging against the late and therefore defenceless Pauline Kael was thrashed out publicly. Fujiwara called Kael the anti-Daney, and then summed up his own talk by declaring that “The point is, what is Kael’s point?” By the end one knew that we were now truly beyond Daney, and it is true that the exercise was not beneficial…sir. It is worth noting that throughout the day’s proceedings Senses of Cinema received much praise as an exemplary space for productive writing on film. And surprisingly the one great speaker of the afternoon panel was someone who had apparently taken something of a blow from a review published in Senses of Cinema: Stuart Klawans, who began with a yellow strip of paper with Manny Farber’s phone number and ended with a sentiment of feeling inadequate as a critic before the body of world cinema. That is, before the body of world cinema, he asked, who is an honest critic? The further into the day, the greater the mayhem, the more the sense that the various participants had no idea who they were or what their function was, and that the audience was spying on a group therapy session for critics, permeated the room. It was getting crowded and time was running out, again in the double sense of the conference coming to a close and of a kind of collective paranoia that the world (or really just America) was drawing the curtains on the career of the critic. But it was as if the organisers had had some presentiment of how all this was to unfold, a narrative sliding from bright beginnings and new discoveries downward into the abyss of personal conflicts and self-doubt, the discovery of a corpse that appeared to be film criticism, and then the majestic return of those who sent us on our journey with happy faces, now indignant to see the mess that had been made. All of which is to say that a great relief was felt when Dudley Andrew and Jean-Michel Frodon returned to close the conference, not necessarily because one wanted the conference to end, but truly they offered a degree of much needed confidence. Dudley Andrew mentioned once again that if the downtrodden critic is afraid that good film criticism is disappearing they should consider logging on to Senses of Cinema. And then came a positively grand finale in which Jean-Michel Frodon pitched himself against the preceding few hours. The critic, he announced, is not in the service of selling films to people, that is not the job, he serves no client, not one. If he has something to say about Lord of the Rings 3, then he is to say it, and if by the same measure he has nothing to say about a small independent film then he doesn’t need to say it. The critic’s job is not the same as an advertiser’s. He apologised for his perhaps aggressive tone, and the conference ended. It would seem then that for a moment we have reached another or perhaps the same aporia: The Cahiers crowd masterfully discussed Daney, and the non-initiated fumbled. So, again how will Serge Daney cross the frontier into English? Especially in the United States, will we even let him in? It was not the time to belabour the subject of the future of film criticism, which seemed tacked-on, again suggesting a fear that Daney alone could not draw a crowd, that he could not pay his own way. What we want to know is what to do with Serge Daney in English. Are we trying to make him do what we would like him to do – that is, to take up the role of a new theoretician to save cinema studies, film criticism or film theory? Can we convince academics that Daney is able to offer film studies a coherent and dynamic conceptual apparatus, can we insist that he is our next Bazin, our next Deleuze? Another question that may be more interesting is are we upset in a strange way that Serge Daney won’t do what we don’t want him to do? The idea being that we speak of Serge as someone doing something different, something that can be a contribution to the contemporary field of film theory. We say we want him to do what he does best, we want the voice of Daney to reorient our ways of doing and thinking cinema and yet as he does what he does we desperately look for the theory, the thing to grab on to, the key terms, the architecture, the strategy, the discrete units of film syntax, and then if we don’t find it we plant it there like dirty cops at a crime scene, shouting aloud “There it is! There is the theoretical intervention we were looking for, it’s called the visual or the image or the films that watched our childhood! See how these provide a strong theoretical vantage point? See how we can make Daney look like a successor to Metz? a Lacanian? a Deleuzian?” When in fact he is all of the above, yet what we might want to consider doing is letting Daney demonstrate his love not just for film, but his love of writing about film, his melancholy love for the world, or even his love in fact for his mother, like Barthes. But you see there it is again, we can say he recounts his childhood like Benjamin, or he really loves his mother like Barthes, and this again is not to have faith that Daney can be Daney without being Barthes, without being like Barthes. Theses are names to orient ourselves, names that are familiar, because as we try to introduce someone new we get scared they may not be worth the time (and this measurement of worth may be financial). But he is worth the time without being Barthes or Benjamin, and yet truly he is like both of them, not because he needs to be for us to enjoy him, to learn from him, but simply because he is a melancholy mythologist, a traveller, a writer of short, rapid and pointed articles, and a lover of childhood. 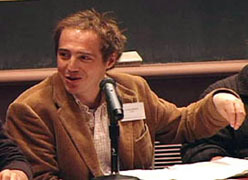 Paul Grant is a PhD candidate in Cinema Studies at New York University. He is also a filmmaker and translated Serge Daney’s Persévérance into English. It was published under the title Postcards from the Cinema by Berg in 2007.